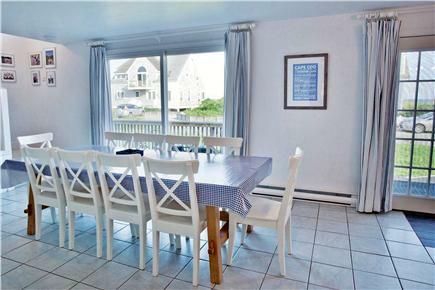 Expanded beautiful Ocean View House in GIOC With 4 AC units. New living room addition with entrance from new deck. Second floor bedroom with bunks. Sleeps 7. View from second floor deck. Private beach just steps away. We are adding a new wing with a new living room and a new bedroom on the second floor. The expanded house will have 4 bedroom and will sleep up to 6 adults and 6 children in a king, 2 queens, and 3 sets of bunk beds. 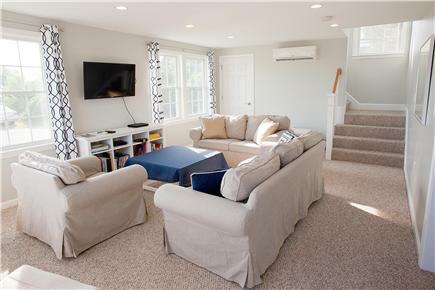 Ideal for large or extended families with children, this ocean view house is just 20 feet from the boardwalk entrance to the 1/4 mile white sandy Nantucket Sound private beach and only a short walk to the life-guarded swimming pool trough Labor Day, tennis courts and playground. First floor consists of a living room with flat screen TV/DVD/, kitchen with white cabinets, Corian countertops and newer appliances, and a dining table that seats 12. There are 1 queen bedrooms, with a flat screen TV/DVD, a bathroom with a tub shower vanity and toilet. 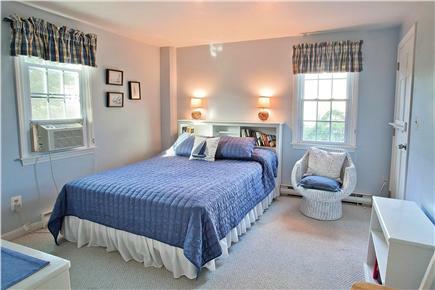 There is a second Queen bedroom. 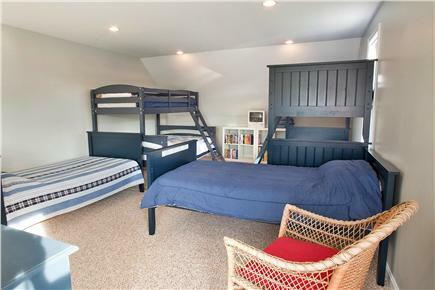 The other bedroom is in the new addition and it has 3 sets of bunk beds ideal for up to 6 children. The master suite is on the second floor with king size bed, seating area with flat screen TV/DVD, computer desk with wireless router, and Anderson sliders to an ocean view sun deck. There is a laundry closet with side by side washer and dryer. The master bath has a Jacuzzi, glass door shower, double vanity and toilet. There is a new full length deck on the first floor with picnic table and propane gas grill and an outdoor shower on the side of the house. 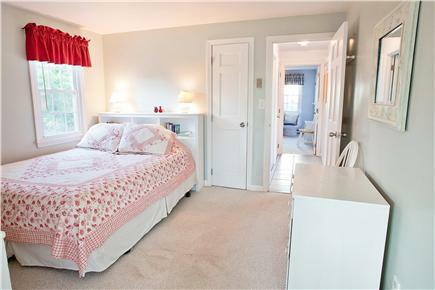 The house is located in an oceanfront gated community with a guard gate and speed bumps. Additional availability info: 3 day weekends are available in September and October. This is a Saturday to Saturday vacation rental. Additional pricing info: Please call Franklin or Melanie for special weekend rates in September & October. State and local taxes of 14.45% will apply. We spent a week at Franklin and Melanie's lovely home. The house was perfect! It had every amenity we required. We loved the location as it is steps to a gorgeous beach, in a charming neighborhood. Franklin and Melanie were very warm and welcoming. We would come back in a heartbeat. We had another lovely time this year in your beautiful home. Thank you so much! The weather was great, which made every day we had at the beach amazing. We could not have had a more perfect week here on the Cape. It was filled with so much fun, with everything from paddle boarding to watching the sunset. Thanks again, Franklin and Melanie. 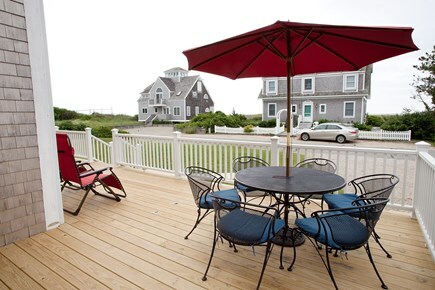 We had a fantastic week on the Cape and another lovely time in your beach house. Perfect beach days filled with boogie boarding, sand castles, rafting, and Uno. The pool and tennis courts were a fun retreat from the beach. Couldn't have asked for a better week with family and friends. One highlight -- Emery learned to ride a bike. Yay! No more traing wheels! We had a great time, and the weather was great -- only one rainy day! We enjoyed everything about the beach, sand fun, boogie boarding was the best. Paddle boarding was fun too! We had cousin sleepovers and fun times at the pool. Loved watching "Parent Trap" and "Spiderman." Frequented the Pancake Man, the inflatable park. Loved Cape Annie gift shop. Great kid games for a rainy day. Cape Cod is a great vacation spot! "Cape Cod Great Island was a great beach!" "Ice cream man was the best part." "Loved bike riding and scooters!" "Loved how the waves were not always too big." Thanks for another great year, Franklin. We have had great weather over the past week. We have so many memories here and are looking forward to so many more. Thanks and see you back next year for YEAR 5! Great weather, great times. We had a wonderful time at Great Island Ocean Club on the Cape. Great memories with Mimi and Papa. Emery's favorite activities were fishing, playing at the beach, treasure hunting, and jumping in the inflatable park. Jameson's favorite part of vacation was scooting playing at the park. The best of times. We certainly enjoyed a wonderful week of weather here at your beach house! Wonderful memories of children and grandchildren sharing with the rental next door helped to include all 11 of us! The beach is wonderful -- the ice cream man was an exciting and anticipated event every night! All of us did our ALS "ice bucket challenge" on the beach. Our one rainy day was spent on a trip to Woods Hole to see the seals! Thanks for sharing your beach house with us. Thanks for sharing your beach house with us. The weather couldn't have been more perfect -- even the few thunderstorms that developed waited until late afternoon. We loved listening to the waves and watching the sunset (and sunrise) over the water. What a breathtaking view! This is our third year at "the beach house." It never disappoints! We had a great week. Thanks for sharing your home with us and giving us wonderful memories. Our young daughter, Breanna, added this: I had a great time in the beach house. I played cards and watched TV in my room! I can't wait to come back! Wonderful experience was had by all. The location was perfect, and the house is just beautiful. we put on a new roof. 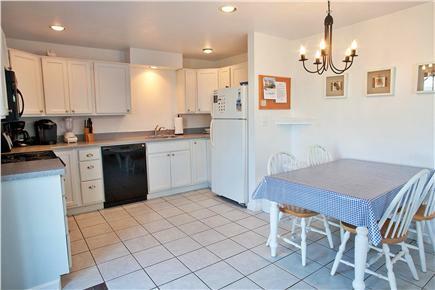 In 2010 we updated the kitchen with new appliances and Corian counter tops. In 2014, we put in new fixtures in the downstairs bathroom. In 2016 we put on anew addition with living room and bedroom on top. in 2017, we had new deck installed to include the front of the entire house including the new addition. During the spring of 2018, we will be installing a new front door and new sun deck to match the new deck downstairs. We retired to Cape Cod from New Vernon, NJ in 2002. and currently live in newly built house on Long Pond in South Yarmouth. We have 4 children in Hingham, Simsbury, CT, Chicago, and Philadelphia and we have 10 grandchildren from 14 down to 1. 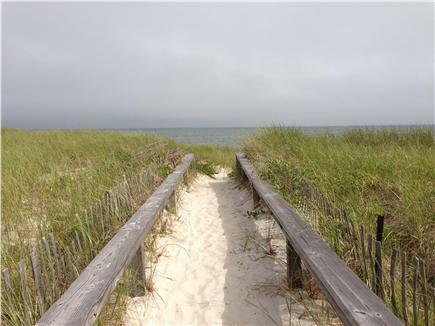 We are only 20 feet from the board walk over the dunes to a 1/4 mile private beach. yet our rent is much less than others houses with similar accommodations. We continue to add new features every year. There is an association swimming pool within a 5 minute walk, and tennis courts within a 10 minute walk or a 2 minute ride. There is playground for small children. We have a large front and side lawn for children to play on. There is a large and expanded deck that's 13 feet deep in the front of the new section and 9 feet deep in front of the old section. There are plenty of restaurants in all price ranges from fast food to fancy all along Route 28 in West Yarmouth and South Yarmouth. 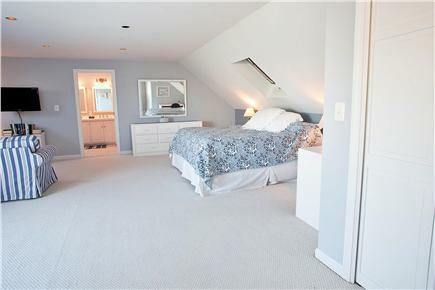 Hyannis major shopping is 5 miles away. South Yarmouth has every thing from post office, to bowling alley, fast food, garden center, 2 drug stores, Dunkin Donut, McDonald, discount store, hardware store. furniture store. etc. etc.